In this edition of The Baer Facts, I talk with Kyle Lacy of ExactTarget about Twitter’s new Nearby feature that will give users the option of seeing tweets from other users in the vicinity. Is This a Feature or a Freak-Out? Note that users can opt-out of this feature (which is still in the testing phase), the same way that Twitter members can choose to not pass geographic data along with their tweets. But is Nearby a plus or a minus? 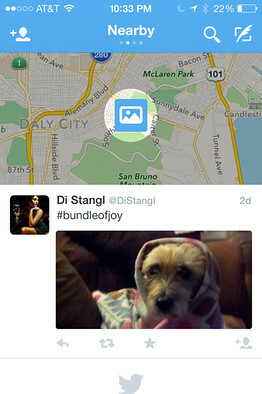 I see two scenarios where Twitter Nearby could be useful. First, the kismet of discovering interesting people that are around you, enabling you to meet up with them, or at least connect with them virtually. Admittedly, this is very similar to what other apps like Highlight have been doing for 18 months. Thus, Twitter is following its now-familiar playbook of watching other companies innovate on its platform, and then either buying that technology, or copying it. Having the “here’s who you know in this area” feature built-in to Twitter itself, rather than having to use a separate app like Highlight would presumably spike usage. As mentioned in the video, it’s a scenario I am faced with constantly when on the road (51 conferences in 2013). I know that there are people I am acquainted with in almost every city, but I forget who lives where. Maybe it’s a sign of the social media times, where we know people by their avatar more so than their street address of phone number. Or maybe I’m just a bad friend. Either way, I would be DELIGHTED if Twitter pinged me when I stepped off the plane to remind me who is in the region. The second situation where this could be a boon is in ad targeting. I can see Twitter rolling out an ad product that allows businesses to push offers to Twitter members in a hyper-local context. Today, of course, Twitter will enable you to target by city. Nearby, however, presumably could be used to deliver offers at the street/neighborhood level. Interestingly, this would put Twitter squarely on the turf of Foursquare, as pointed out by Brent Carnduff on Business 2 Community. But for many people – I use my wife as the example in the video – this kind of “someone on Twitter is right behind you” is the worst kind of creepiness. For marketing professionals and those who willingly allow social media to envelop them like a dense fog (guilty), Nearby is a real advance. For “real” people, however, it’s the manifestation of everything they fear about social. The big takeaway is this: Very soon, location will not need to be retrieved. Location will instead be an omni-present layer of our communication, built-in to whatever device or message modality we choose to utilize. The question isn’t whether this type of proactive location usage will happen. It will. The question is whether location will be used for good, or for evil.